Why go? If you’re looking for five-star luxury with a traditional feel that can also accommodate (wo)man’s best friend, this is the place. Best for? Peace and quiet, privacy and countryside, long walks and pebbly beaches. Looking like a grand medieval residence complete with beamed ceilings, Bailiffscourt was actually built in 1927 for a member of the Guinness brewing family. With 30 acres of private grounds, it’s ideal for both relaxation and indulgence − the only sound you’ll hear is your own sigh of relief. The look: Welcome to a rambling manor house with thatched outbuildings and peacocks. Inside it’s all dark wood panelling, flagstone floors and Elizabethans eyeing you from oil paintings. There are 39 rooms including the signature Baylies Suite which comes with its own fireplace and logs ready to burn, plus a TV that rises magnificently from a huge wooden chest at the foot of the bed. 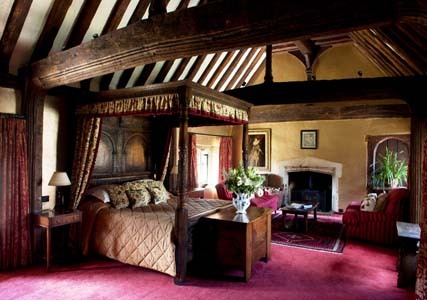 Other feature rooms have four-poster beds, stained glass leaded windows and miles of damask cloth. The style is regal with heavy fabrics and lots of embroidery, but you also get lovely modern bathrooms where you can pamper yourself with Temple Spa products. If that’s all too much ask for one of the contemporary superior rooms. I’m hungry… Dogs are welcome in the cosy lounge of the ground floor adjacent to the restaurant, which goes down well with our Miniature Schnauzer, Mimmo. The Tapestry Restaurant, festooned with magnificent medieval decorations, has several ante-rooms which create a cosy private dining bolt-hole for dog-owning guests. The à la carte menu created by head chef Russell Williams favours modern English dishes including a delicious local duck and seasonal apple pie. Three courses costs a reasonable £49.50 for such fine dining, while a two-course lunch is £18.50. A decent bottle from the extensive wine list will set you back around £30, and you can get expert guidance from the French sommelier who’ll talk at length about what works best. 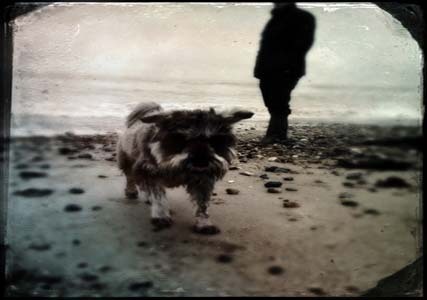 While you’re there… Walkies couldn’t be easier − there is a long stretch of very quiet pebble beach just a short walk away and the route is well signposted. Within ten minutes we’re all having fun dodging the waves and trying to find the ball. Poop bags are provided and there are disposal bins around, all things that become important as all dog-owners know too well. 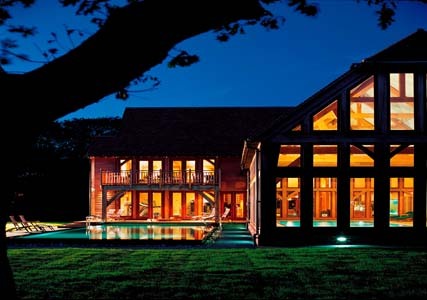 If you really want to unwind, the Sussex barn-style Bailiffscourt Spa has a heated outdoor pool and hot tub. Its treatments have intriguing names like ‘Vespers Drift Away’ and ‘Matins: Fully Restored’ (from £80). Arundel (arundel.org.uk), with its fine castle, cathedral, antique shops and riverside walks is just a ten-minute drive away. Dress code: There’s definitely a tweedy vibe here, so pair this with your vintage dress, add some wellies and you’re away. Dinner is more formal but not stuffy, time to bring out your velvet and family heirlooms. Book now: Bailiffscourt Hotel, Climping Street, Climping, West Sussex, BN17 5RW (01903 723511; hshotels.co.uk). Double rooms cost from £220 including breakfast and use of the spa. A ‘It’s a Dog’s Life at Bailiffscourt’ package costs from £399 based on two adults sharing with a dog, including a night in a four-poster feature room with dinner, plus (for the true love of your life) a Bailiffscourt Doggie Welcome Kit, a guide to local dog-friendly walks, daily doggie meals including nutritious organic fare from James WellBeloved, a pig’s ear treat and a surprise gift. Woof woof!